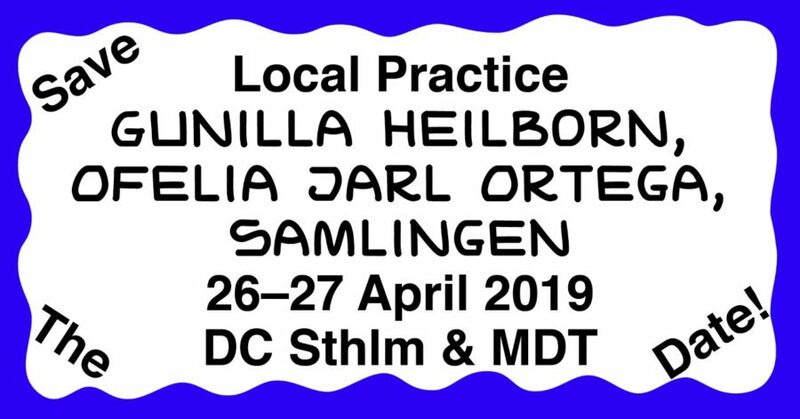 Local Practice is a continuation and development of the symposium Within Practice—this time in a local miniformat, organized by choreographer Björn Säfsten. We’ve invited choreographers and performers Gunilla Heilborn and Ofelia Jarl Ortega to share their practices 26–27 April. Additionally, Samlingen will host “Practice/s—An Evening of practice schmactice—the things we do and how do you do?”. Local Practice jumps off our deep love for artistic practice and our curiosity surrounding our fellow movement-makers. Our gatherings aim to create a space where dialogue is sparked through three different formats creating a environment that stimulates discussions and sharing. In one of the formats one can experience a practice through ones own body, one gives the possibility to take part of a practice-presentation by the invited artists and one format is an evening of practice sharing between all the artists that takes part of the two days. Local Practice invites professional dancemakers and performers and curious minds. “Within Practice” is developed by Säfsten Produktion and DOCH and had its first edition in Stockholm 2018. Look out for our second major edition in the future. Säfsten Produktion presents Local Practice in collaboration with Danscentrum Stockholm and MDT. Made possible with support by the Swedish Arts Council, Stockholm Stad and The Swedish Arts Grants Committee. Participants in Local Practice take part in two workshops, an evening with Samlingen and two practice presentations during the course of two days. Cost for professional dancers and performers SEK 200—which includes participation in the workshops and entrance to the evenings at Danscentrum Stockholm. If you are not participating in the workshop, but wants to see the practice presentations, you can book your tickets through, localpractice@bjorn-safsten.com. Registration is done through localpractice@bjorn-safsten.com no later than March 31. Please send a short description of your background and current undertakings. The event is limited to 40 participants. 200kr: which includes participation in the workshops, entrance to the practice presentations and the sharing evening with Samlingen at Danscentrum Stockholm. 50kr: entrance to the practice presentations at Danscentrum Stockholm.